Cleaning up my blog today. If you haven't posted in a while, I'm updating the blogroll with active bloggers. Hope to hear from you soon. Caos on F Street invites you to visit the downtown gallery any First Friday as part of F Street arts, the suite of art studio spaces in the newly developed Carroll Square building featuring Fine Art and Fine furniture. On exhibit at Caos on F is the work of painters Michael Berman and Quint Marshall, ceramaist Joe Hicks and furniture by Matthew Falls. The show continues until January 5. Caos on F is an artist owned, artist operated collective at 923 F St. NW in DC launched as part of F St arts, the suite of art studio spaces in the Carroll Square building. The National Endowment for the Humanities is encouraging educators across the United States to apply for 2009 summer study opportunities in the humanities. Each summer, the NEH supports rigorous national, residential seminars, institutes, and workshops located in the United States and abroad. Program participants receive stipends to help defray travel and living expenses. For more information, including eligibility and application information and details about each of the seminars, institutes, and workshops offered, visit the NEH Web site. WASHINGTON, DC— In an effort to continue the momentum of ensuring the District is transformed into a world-class city, today Mayor Adrian M. Fenty announced the appointments of four District agency and office directors. While this product is an acrylic paint, it really feels like no other paint. The distinctive performance features of OPEN Acrylics are built into the product. Without the need to modify their paints with an extensive array of retarders, mediums and additives, or to race to finish their work before the paint dries, artists are brought closer to their work. If an artist does desire to modify opacity or speed up drying time, OPEN Acrylics are designed to be a seamless extension of the existing GOLDEN line of acrylics and mediums and may be blended with them to achieve the desired result. In addition, the OPEN line is supported by just two mediums and one additive, which are designed to be very intuitive for the artist to grasp. These products literally free digital images from the confines of prepared, commercial print media. The virtual brushstrokes of programs such as Photoshop® can finally take on weight and enter the rich material world of acrylic gels, mediums and colors. Speaking of food, I was paired with Vegetate Restaurant for the ZCAF Food Calendar 2009. This gicleé image is published as the March page for the 2009 calendar. The image sums up my year in 2008. My sister modeled for the figure in the plate or fishbowl, however you see it. The fish remind me of youthful adventures near the Gulf Coast waters, and my dad's love of tropical fish or any fish for that matter, even those pesky sharks! There's even a big fish tale in our family, where dad caught a shark with his bare hands! but that's another story. This dreamy image, Grande Assiette, reminds me that life can be fluid, magical, transformative. My big plate is filled with observation as well as wonder and delight. I hope what's on your plate is too. Do you need a source for corporate or family gifts for the New Year? Support our local businesses and try Convention Floral in Shaw. You can call in for a flower arrangement to be delivered. Today, the proprietor, Nubia Fasil welcomed me into her small shop. 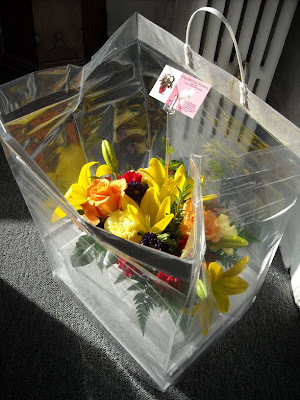 I left with a lovely arrangement packaged in a see thru carry bag which delighted my client. Enjoy the artful flowers. A Zenith Community Arts Foundation 2009 calendar event, silent auction contributor, benefiting the Capital Area Food Bank. "a sampling of the reasons art made us smile, think, sigh or... even get a little choked up in 2008." "Politics are usually unavoidable in D.C., and in 2008 especially many of the offerings in local galleries and museums skewed sharply political. And yet, mirroring a larger trend, cynicism seemed to shed as the election grew closer, leading to the optimistic “Portraits of Power” show at the Corcoran and the magic touch of Shepard Fairey....and the unabashed adoration for collector Philip Barlow in “15 for Philip,” a homage to a D.C. art patron." Jeffry Cudlin writes a year end review on the state of Washington, DC museums in the Washington City Paper. "The state of D.C.’s art museums at the end of 2008 presents a quandary not unlike the one currently on everyone’s mind in the financial sector: Should troubled institutions be rescued or allowed to fail?" New Year's Eve Shoutouts: Ring in 2009 in Shaw at VEGETATE! Looking for a place to celebrate the New Year? Among other restaurants in Shaw, Vegetate, who recently participated in the ZCAF Food Calendar Fundraiser is offering two special New Year's Eve seatings. Read here...New Year's Eve Shoutouts: Ring in 2009 in Shaw. Available at Zenith Gallery, the Capital Area Food Bank, Periwinkle, Politics and Prose, Bridge Street Books and other locations for a minimum donation of $15. 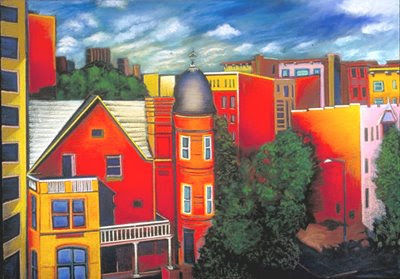 The Bethesda Arts & Entertainment District is currently accepting applications for the fifth annual Bethesda Painting Awards, a juried competition honoring four selected painters with $14,000 in prize monies. Deadline for slide submission is Friday, February 20, 2009. Up to eight finalists will be invited to display their work from June 3 – July 4, 2009 in downtown Bethesda at the Fraser Gallery. The first place winner will be awarded $10,000; second place will be honored with $2,000 and third place will be awarded $1,000. A “young” artist whose birth date is after February 20, 1979 may also be awarded $1,000. Artists must be 18 years of age or older and residents of Maryland, Virginia or Washington, D.C. Each artist must submit five slides, application and a non-refundable entry fee of $25. 2. The Russians Are Coming. Are the Russians Coming? Read Article, 2008 in Review: Trends of the Year HERE at ARTINFO. David Grosz, Lyra Kilston, Jillian Steinhauer, and Kris Wilton contributed to this article. Reclaimed, an exhibition that focuses on everyday common objects that are reclaimed, recycled, reinterpreted and transformed into art. From Marcel Duchamp’s “ready-mades” to Robert Rauschenberg’s “combines”, artists have been for years recycling and reclaiming everyday common objects and transforming them into something new and unique. This exhibition is open to all artists nationally and internationally to submit work that has been reclaimed and transformed into their own personal artistic statement. Steven and Linda Krensky are avid art collectors and gallery owners. They have a contemporary art gallery in Baltimore known as Light Street Gallery. The gallery came about for their need for more space so that they could continue to collect art but also to help promote artists. Please download prospectus for complete guidelines and instructions on how to enter. Image entry will be by PC compatible JPEG digital files only. Lia Newman - Director of Programs and Exhibitions at Artspace in Raleigh, NC. There she is responsible for organizing more than thirty exhibitions per year. Paul So - Visionary founder for both the Hamiltonian Artists and the Hamiltonian Gallery. He is a painter and a physics professor at George Mason University. Philippa Hughes - Founder of The Pink Line Project, an organization dedicated to building community and transformation through art. Please download prospectus for complete guidelines and instructions on how to enter. 17th Street Mansion, Anne Marchand, oil on canvas, 36"x48"
After two days and a canceled Delta Flight we are finally heading home today! New Orleans and Hot Springs, Arkansas held fine holiday festivities. I look forward to celebrating the New Year in the place I call home... DC. See you around the hood. As such, Zenith Gallery (Zenith Consulting Services) will manage and curate arts projects, provide high quality services to its corporate and residential clients, and expand its consulting, commissioning and acquisition business. Goldberg says she will also arrange shows, programs and events in locations in and beyond Washington, DC while also organizing artist studio and gallery tours. “My motivation for opening Zenith Gallery 30 years ago … to nurture talent and meld art with commerce and community … still inspires me. We’ve had a wonderful run, celebrated many milestones and become a mainstay in Washington’s art world. Most of all, we’ve been able to grow and sustain what some call a difficult business, thanks to the support of the Penn Quarter Neighborhood Association, our landlords and especially the many artists, patrons, staff, vendors, fans and businesses we’ve worked with for 30 years on Seventh Street, and at Zenith Square where we first opened our doors at Rhode Island Avenue and 14th Street NW. “But, now it’s time for a change and a new phase that will enable us to focus on projects and priorities that we’ve wanted to pursue for years, but not had time, given the demands of operating a storefront gallery. True to tradition, Zenith will close its doors on Seventh Street with fanfare and the same types of shows and events in January and February that have made the gallery what it is today … a friendly oasis where people convene to discover, appreciate and purchase great art. For Goldberg, Zenith’s future holds opportunities and promise as she begins to explore options and plan how she wants to present, provide and promote art in her next phase as a Washington impresario and activist. In the next few years, she’s also slated to move Zenith Gallery to a luxury hotel at Mt. Vernon Triangle, which is part of a multi-use project (The Arts at 5th & I, awarded by Mayor Fenty) that will include a residential complex, jazz club, restaurant and more. Now in our 30th anniversary year, Zenith is recognized for breaking new ground with a dynamic mix of contemporary artworks that stimulate, engage and amaze. A member of the Art Dealers Association of Greater Washington, Zenith places art by established and emerging talent in public, residential and corporate collections. with champagne, sweet sensations and a chance to purchase art from Zenith’s fabulous vaults. Tickets, only $35, benefit the Zenith Community Arts Foundation. your favorite Zenith artists at incredible prices. This Request for Qualifications seeks an artist or artist-led team to create a series of art to mark the principal entry points into West Philadelphia. These site-specific works are being commissioned as part of a broader community development strategy. The public art component is being managed by the Philadelphia Mural Arts Program. The selected artist or team will be asked to prepare conceptual designs for a prototype gateway or system of gateways, create one gateway artwork, and conceptualize a youth component that can be executed by MAP’s Mural Corps. The overall budget for conceptual design, the initial project and the artist’s involvement in the youth component is $42,500. All submission requirements for this Request for Qualifications must be received (not postmarked) by 4:00 pm on Friday, January 23, 2008 at the mailing/delivery address given below. Please note that submission will not be accepted via email or fax. Submissions will be due January 23, 4 p.m. This is a receipt, not a postmark, deadline. Short-listed artists will be notified by January 27. Short-listed artists will be invited to meet with the SCI West Philadelphia Steering on January 30. Concepts will be due on at 4 p.m., February 20. Short-listed artists will be invited to make presentations to the community on February 24. Final selection will be made by February 27. The gateway project must be substantially complete by June 30, 2009. The Mural Corps component must be completed between June 29 and August 7. Children in this program create art works as a means of coping with the stress and trauma of cancer and its treatment. The program's goal is to create a safe environment for children where they can gain a sense of control and express themselves, thus be better equipped emotionally to fight cancer. Recent experimenting with inks and translucency. W, F, Sat 1 - 6pm | Th 2 - 7pm | and by appointment. Own a piece of Crystal City Aviation History! 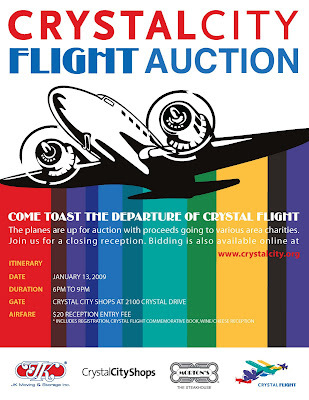 The Crystal City Business Improvement District's overwhelmingly successful 2008 initiative, Crystal Flight - A Celebration of Art & Air, will have its final salute and charity auction send-off on January 13, 2009 from 6:00 - 9:00 PM. The airplanes will also be available for viewing on-line starting on December 5, 2008 with online bidding beginning on January 1, 2009. The proceeds from the auctioned airplane statues will be donated to a variety of area charities, designated in advance by each airplane's sponsor. The charity auction will be held at the Crystal City Shops at 2100 Crystal Drive where the airplanes are on public display until the auction. Tickets for the live auction will be sold at the door for $20.00 and include a Crystal Flight commemorative book, registration for the auction and a wine and cheese reception. Additional copies of the book, Crystal Flight - A Celebration of Art & Air, are available for purchase through the Crystal City BID website for $15.00. 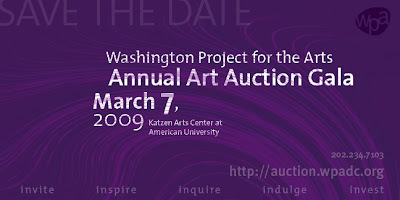 Please note that starting bid prices are subject to change prior to the opening of the auction on 1/1/2009. Tom Sherwood, from channel 4 WRC TV heard that Zenith Gallery is closing on 7th Street and did a story today about the gallery on the 6pm news. Did anyone catch it. A party you don't want to miss. *Nearly 15 years in the making, Huong's Peace Mural is the culmination of searing memories that bring history to life and depict the universal pain of war and hope for peace. The complete mural includes nearly 2000 paintings. Far more than simply an exhibition of art, the Peace Mural is highly interactive and participatory as it evokes civic engagement and calls forth from viewers a response through reflection, dialogue and action. 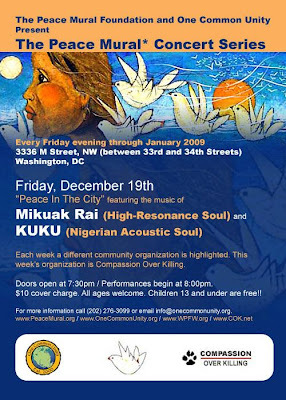 This concert series, held at the Peace Mural exhibition, compliments the artist's vision by featuring musical performances that raise consciousness through creative expression and resonate with the sounds of healing and restoration for all people and the planet. A panel discussion tomorrow evening at Chicago’s Cultural Center. Paul Klein will be sitting in with Dawoud Bey, Juan Angel Chavez, Tony Fitzpatrick, and Joyce Owens discussing How to Turn Your Art into a Career, talking about “what they do to have their art take care of them”. The forum is open to the public, and admission is free. Moderator Paul Klein is a curator, art journalist, activist and former gallerist who has long been an art advocate and proponent for art in Chicago. The DC Commission on the Arts and Humanities (DCCAH) in collaboration with Department of Youth Rehabilitation Services (DYRS) seek an artist or artist team to design, create and install a mural that will be centrally located in the new 60-bed state-of-the-art secured juvenile rehabilitation facility located in Laurel, Maryland (the Youth Center). The goal of this project is to help enliven and reinforce a sense of place within this facility and encourage the youth in positive behavior through design and creation of this large colorful mural. The selected artist(s) will be required to engage youth in the project. Beginning Saturday, Dec. 13, 2008, simultaneous exhibitions at the Walters Art Museum and the Contemporary Museum celebrate the works of renowned photographer Dawoud Bey. At the Walters, Portraits Re/Examined: A Dawoud Bey Project will feature contemporary photographs by Bey juxtaposed with historic portraits from the museum’s private collection. Dawoud Bey: Class Pictures, a companion exhibition of more than 40 of Bey’s portraits, will be on view at the Contemporary Museum. Both exhibitions run through Saturday, Feb. 16, 2009. Portraits Re/Examined is the result of a three-week summer residency at the Walters during which Bey and a diverse group of 12 Baltimore-area public and private school students collaborated to curate the exhibition. The exhibition will explore how race, class, and identity have been addressed in portraiture throughout history. These themes became central to the teens’ experience and the project as a whole. The Walters’ collection is the basis for discussion about the role of museums in society and the relationship that contemporary art has in museums with historical collections. The exhibition will be on display in the museum’s fourth floor Centre Street Drawings Gallery. To create Portraits Re/Examined, students worked with Bey to select historic drawings, paintings, and portrait miniatures from the Walters’ collection, positioning them alongside 10 of Bey’s similarly evocative portraits. The student-curators also will create auxiliary components for the exhibition, including a blog, Facebook page, podcast series, and cell phone audio tour. Both exhibits open with a public lecture by Bey and his teen protégés at the Walters on Saturday, Dec. 13 at 2 p.m. The artist discussed his unique approach to portraiture and the process of creating Portraits Re/Examined. On Monday, Jan. 19, 2009, at 3 p.m. in the Walters’ Graham Auditorium, Bey will be in dialogue with fellow contemporary photographer Carrie Mae Weems. They will discuss both exhibitions as well as the range of Bey’s photographs from 1975 to the present. Admission to this discussion is free for members of the Walters, $10 for non-members, and $5 for students. 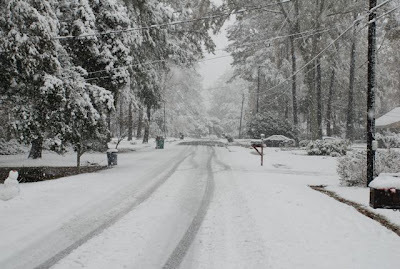 Not everyone thought the southern snow was cool, this family did. "We had 5” fall in 2 hours. We had a blast all day Thursday making snowmen and having snowball fights"
JOSEPH BARBACCIA, CONSTANCE BERGFORS, JESSICA BRAITERMAN, MELISSA BURLEY, MAXINE CABLE, MAHWISH CHISHTY, ELIZABETH CRISMAN, BREON GILLERAN, ADRIENNE HEINRICH, DAVID HUBBARD, GARY IRBY, MARY VIRGINIA LANGSTON, KAREN LE COCQ, MATT MAC INTIRE, HOWARD MCCOY, MARY MCCOY, JOHN PARKER, JUDITH RICHELIEU, SARAH STOUT, ANDREA URAVITCH, CLAUDIA VESS. Hamiltonian Gallery and Hamiltonian Artists are proud to announce the opening of a three person exhibition featuring James Rieck’s newest series of larger-than-life oil paintings, Linda Hesh’s photographic works documenting recent installations and products used in them, and Youngmi Organ’s delicate drawings constructed from individual strands of her own hair. Including both bold moments and subtleties, each artist presents an idiosyncratic viewpoint on our material world. Nevin Kelly Gallery has moved to a new location in Columbia Heights last week. They are in the Highland Park complex at 14th and Irving Streets, NW just above the Columbia Heights Metro station on the Green Line. You can tune into the gallery blog, http://www.nevinkellygallery.blogspot.com for information. 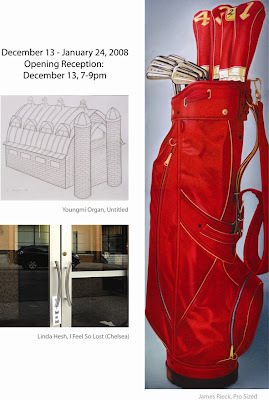 Opening reception, Saturday, December 13, 6-8PM. a curated group exhibition of small-format paintings by nationally recognized artists whose work reflects the interplay of concept, complexity, and scale. WASHINGTON GLASS SCHOOL OPEN HOUSE AND HOLIDAY SALE!!! Annual Holiday Open House & Sale – this year's sale will be bigger & better than ever – the surrounding artists studios will all be open - come on by and make a day of art! There will be art, music, food, jewelry, craft, class discounts & more! Artwork by Tim Tate, Michael Janis, Erwin Timmers, Syl Mathis, Liz Mears......and and many more of the region's most accomplished artists will be shown at incredible holiday markdowns! What : Washington Glass School's Annual Holiday Party and Sale! Saturday, Dec. 13, from 1 - 5 pm. Ellyn Weiss, 12 linear feet of art,"November 5, 2008"
Open Studios and sale for Sinel/Stewart/Weiss, plus artists all over Mt. Ranier and environs - including the annual Washington Glass School Holiday Sale. Washington Project for the Arts announces the launch of the fourth annual Experimental Media Series: "When Absence Becomes Presence," an exhibition and screening program that explores the play between two separate, but linked conditions of absence and presence, and which reflects upon the very nature of time based media. Curators Sonja Simonyi + Niels Van Tomme have selected a staggering variety of experimental artworks that include sound art, music, literary readings, video art, as well as a mysterious sound recording. In addition to the screening of selected works from the exhibition, winners of the Kraft Prize for New Media and the WPA Experimental Media Prize will also be announced. Niels Van Tomme is a curator and researcher. His exhibitions and screenings are shown internationally and investigate the sociopolitical aspects of contemporary audio-visual culture. Since fall 2007, he is the Curator and Director of Arts and Media at Provisions Library in Washington, DC. CIVILIAN ART PROJECTS is pleased to announce its final exhibition of the year: Media.Mix: 21st Century Collage. Inviting the viewer to examine expectations of collage, curator Iciar Sagarminaga and assistant curator Erin Lingle have selected a group of artists who explore this genre to find relationships between elements and build narratives in their distinctive bodies of work. No material is off limits and diverse methods are explored. Pulling from their individual experiences and incorporating materials that are culturally relevant, the artists establish a collective identity reflecting a consciousness that all matter is precious. The transformations that take place offer an opportunity to revel in the abstraction and creative use of ordinary materials and discarded images. This quiet manifesto of salvaging, not wasting, and finding new life for old pieces, is a poetic and central experience in collage, and one that continues to stretch its boundaries. The creative freedom and versatility found in combining and altering objects, textures, images and sound to create new meaning and aesthetic value creates work that is accessible and extols the enduring power and relevance of collage into the twenty-first century. The exhibition includes sculpture, painting, drawing, fabric and textiles, video, music, and photography by Kristina Bilonick, Cheraya Esters, Steven Frost, Laura Hensley, Anamario Hernández, Steve Ioli, Jennifer Mattingly, Patrick McDonough, Chinaedu Nwadibia, Betsy Packard, Nicholas Popovici, Teresa Sites, David William and a musical remix of sounds by Damu. Most works are affordable, priced at $500 or less. 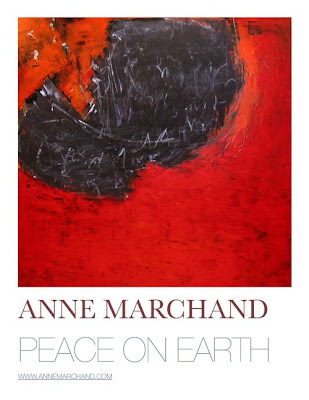 Give the gift of art at the holidays. Margaret Boozer approaches ceramics with an eye for painting and a mind for experimentation. She encourages clay’s physical properties to express themselves in unpredictable manifestations of cause and effect. Drying, warping, cracking- small studio processes echo large geologic events as clay reclaims its origin as earth. Boozer disguises her hand underneath clay’s distortions, then claims authorship with carefully orchestrated compositions driven by the randomness of the result. The work is unexpectedly recognizable as a variety of subject matter that crosses genres between representation and abstraction, painting and sculpture. 10 am - 8 p.m.
A two-site exhibition presented in partnership with Heineman Myers Contemporary Art. 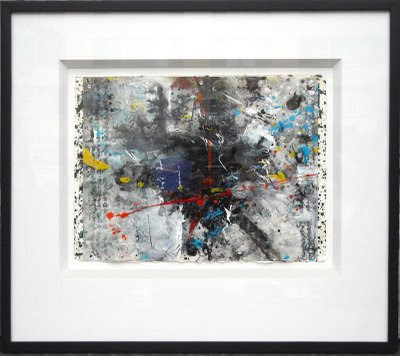 Launched in spring 2007, Transformer's FlatFile features a variety of two-dimensional, unframed works in mediums including photography, painting, drawing, and printmaking - all approximately 16" x 20" in size and smaller. 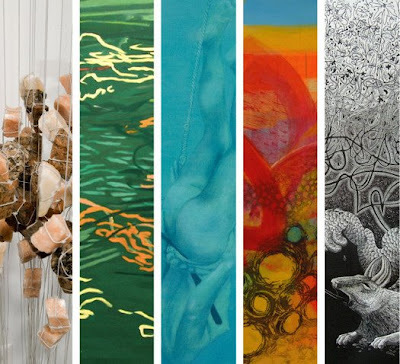 With works by regionally, nationally and internationally based emerging artists, the program is open to artists that have exhibited with Transformer in the past and those who are new to Transformer. Paper Trail will be presented at both Transformer's project space and Heineman Myers Contemporary Art in Bethesda, MD, highlighting different selections from the current FlatFile, as well as new work by Emily Andrews, Victor Aguilar, April Behnke, Alan Brown, Jessica Cebra, Natalie Cheung, Melissa Dickenson, Paul Jeffreys, John Lancaster, Katherine Mann, Nikki Painter, Bondé Prang, Lauren Rice, and Bonaia Rosado. 4728 Hampden Lane, one block South upon exiting the Bethesda station on the RED line. 301-951-7900. Transformer: Wednesday - Saturday, 1-7pm by appointment. Heineman Myers: Tuesday - Saturday, 1-6pm by appointment. Both Transformer and HeinemanMyers will be open by appointment only December 24 - January 5. It's Time for the 2009 Mayor's Arts Awards Nominations! * Excellence in an Artistic Discipline An individual artist or an organization that has demonstrated a substantial history of extraordinary achievement in an artistic discipline. * Outstanding Emerging Artist A promising individual artist or group of artists who have demonstrated excellence and achieved distinction in an artistic discipline. * Excellence in Service to the Arts An individual or a private, public, or government organization that has demonstrated a substantial history of exemplary leadership, financial support, or other services vital to the development of the arts in the District of Columbia. * Outstanding Contribution to Arts Education An individual or organization that has demonstrated outstanding efforts to evoke interest and understanding of the arts. Innovation in the Arts An individual or organization that has demonstrated use of skills or resources to produce art, art programs or services. For an entry form please download the New Guidelines for 2008. * We are also happy to mail a nomination form to you. 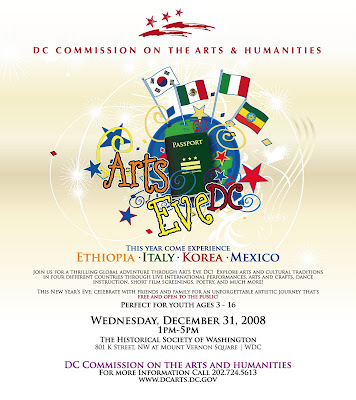 Nominations must be received at the DC Commission on the Arts and Humanities office by 7 pm on Monday, December 15, 2008. H&F Fine Arts is pleased to present concurrent solo shows of works by Alan Binstock and Joan Belmar. Both artists’ work explores the circle of life and construct dialogue assessing the parallels of three dimensional abstract structures and human life. Belmar’s work will serve as a layered backdrop to the translucent sculptures created by Binstock. Alan Binstock’s work explores the forms that express or reflect the sacred, the inner life's varied manifestations of the micro and macro worlds. Many years of work as an architect and now in Master Planning at NASA, Binstock’s work is a result of deep space image and ideas that arise from his observation, reflection and meditation. Whether six inches or 60 inches tall there is an compelling mix of steel and glass, Binstock pushes glass to it’s limit…chiseling as if it were stone. Binstock completed a graduate program at the University of Maryland School of Architecture. He has exhibited at American University Museum and the Corcoran Gallery of Art. Binstock has many private and corporate collectors. and glass, allows Joan Belmar to create worlds where the viewer is allowed to see somethings clearly and some things opaquely. But all things seen are intended to reflect an outer and inner world of psychological stress, fragility and dislocation. Belmar’s work takes on a cosmic-like illusion that carefully entwines photography and optical effects. A native of Chile, he has lived in the United States since 1999. Belmar has exhibited at the American University Museum, the Corcoran Art Auction Gala. He was a nominee as a Mayor’s Award Finalist as an outstanding emerging artist and the DC Commission on the Arts and Humanities. Artist Sidney Lawrence will provide personalized inscriptions and sketches for his 200-edition artist's book, Ink Cities, from 4 to 6 pm on Saturday, Dec. 13, at District Fine Arts, 1639 Wisconsin Ave, NW, Georgetown. Inspired by pocket-sized sketchbooks artists often carry while traveling, the 32-page, spiral-bound publication ($26) presents Lawrence's highly detailed, often fantasy-laden drawings of 24 cities from around the world-DC, Shanghai, Fez, Buenos Aires, Copenhagen and Sydney, to name a few---with a handwritten fact, anecdote or impression to accompany each image. Ink drawings, Lawrence says, are "my Oiuja Board for capturing a city's buzz and sense of adventure." Ink Cities is meant to appeal to all ages, Lawrence stresses. "At the end, readers may use their own words and images to portray their favorite cities on five blank pages," he says. The reproduced drawings date from 1987 to 2008; several are in local and national collections. Ink Cities appears as part of Lawrence's current show at DFA of paintings, reliefs and works on paper (Nov. 15, 2008 to Jan. 17, 2009). The artist has exhibited in the DC area since the early 1980s and also in California and Massachusetts. 1639 Wisconsin Wisocnisn Ave. N.W. Artist, Edith Kuhnle exhibits in many galleries including ones in London, North Carolina, and Washington, DC. Kuhnle has work in numerous collections including the American Chancery in London and American Embassies in Peru and Columbia. She has been granted such awards as a Kreeger Purchase Award, DC Commission of the Arts Purchase Award, and a Commission for Regan National Airport. In addition she participated in an exhibition, "Outward Bound: American Art at the Brink of the Twenty-First Century," which traveled throughout Asia. Washington DC's Coolest Art Tour! Download Handy PDF Map Now! In conjunction with Nilay Lawson's exhibition at Transformer. If You Didn't Know What This Was, Would You Know What This Is? This evening of experimental writings and readings at Transformer will be lead by Transformer Advisory Council Member and Corcoran Professor Casey Smith, along with recent Corcoran grads Mike Terzano, Jenn DePalma, David Williams, and current Corcoran student Caitlin Lennon. Transformer's 6th Annual DC Artist Solo Exhibition presents the work of Nilay Lawson in her first solo exhibition. Questioning whether or not her artistic endeavors only truly exist in the conceptual form, when a project can actually be considered "finished", and if the objects she creates are merely remainders of larger artistic production - Nilay's painting, drawings, and mixed media installations document her obsessive consideration of objects and belongings used, consumed, and often discarded. 1-7 pm through to DECEMBER 6. Thursday, December 4th from 6-9pm. Stop in for some coffee or spiked cider and walk away with the perfect gift for that special someone on your list. On display will be works from artists - Scott Brooks, Mary Chiaramonte, Dana Elyn, Matt Sesow and Chris Stephens - as well as works from some artists coming up in 2009 including Anna U. Davis and Billy Colbert. We will also have an excellent gift selection ranging from hand-made glass ornaments to wood and ceremic pieces. The show runs into the new year – closing on January 4th.